This reader gives a fascinating behind-the-scenes look at groundbreaking research, showing you what the process was really like and how the outcomes often differed from the researchers' expectations. For the first time, you receive a first-hand perspective from the researchers themselves. The reader, organized by type of methodology, offers commentary about varying research approaches, research design, the process of measurement, and the concepts of reliability and validity. Steven G. Brandl is an Associate Professor in the Criminal Justice department at the University of Wisconsin-Milwaukee. His research interests include police decision-making and behavior, police use of force, the relationship between the police and the community, criminal investigation, and program evaluation. Brandl has conducted numerous research projects with several major metropolitan police departments. He is the author of numerous articles in professional journals and co-editor of VOICES FROM THE FIELD: READINGS IN CRIMINAL JUSTICE RESEARCH (Pope/Lovell/Brandl, Wadsworth 2001). Preface. PART I: INTRODUCTION: FOUNDATIONS OF CRIMINAL JUSTICE RESEARCH. 1. Issues in Research Design. PART II: EXPERIMENTAL RESEARCH AND ITS VARIATIONS. 2. Doris Layton Mackenzie and James W. Shaw, Inmate Adjustment and Change During Shock Incarceration: The Impact of Correctional Boot Camp Programs. 3. Michael J. Leiber and Tina L. Mawhorr, Evaluating the Use of Social Skills Training and Employment with Delinquent Youth. 4. Lawrence W. Sherman and David Weisburd, General Deterrent Effects of Police Patrol in Crime 'Hot Spots': A Randomized, Controlled Trial. PART III: SURVEY RESEARCH. 5. James Frank, Steven G. Brandl, Francis T. Cullen, and Amy Stiachman, Reassessing the Impact of Race on Citizens' Attitudes Toward the Police: A Research Note. 6. Simon I. Singer, Murray Levine, and Susyan Jou, Heavy Metal Music Preference, Delinquent Friends, Social Control, and Delinquency. 7. Scott Decker and Richard Rosenfeld, "My Wife is Married and So Is My Girlfriend": Adaptations to the Threat of AIDS in an Arrestee Population. PART IV: FIELD RESEARCH. 8. Thomas M. Vander Ven, Fear of Victimization and the Interactional Construction of Harassment in a Latino Neighborhood. 9. Scott H. Decker, Collective and Normative Features of Gang Violence. 10. Thomas J. Schmid and Richard S. Jones, Ambivalent Actions: Prison Adoption Strategies of First-Time, Short Term Inmates. PART V: ANALYSIS OF EXISTING RECORDS. 11. Robert D. Crutchfield, George S. Bridges, and Susan R. Pitchford, Analytical and Aggregation Bias in Analysis of Imprisonment: Reconciling Discrepancies in Studies of Racial Disparity. 12. Faye S. Taxman and Alex Piquero, On Preventing Drunk Driving Recidivism: An Examination of Rehabilitation and Punishment Approaches. 13. Steven G. Brandl, In the Line of Duty: A Descriptive Analysis of Police Assaults and Accidents. PART VI: SECONDARY DATA ANALYSIS. 14. L. Edward Wells and Joseph H. Rankin, Juvenile Victimization: Convergent Validation of Alternative Measurements. 15. Steven E. Barkin and Steven F. Cohen, Racial Prejudice and Support for the Death Penalty by Whites. 16. Robert E. Worden, A Badge and a Baccalaureate: Policies, Hypotheses and Further Evidence. PART VII: OTHER METHODS. 17. Stephen D. Mastrofski and R. Richard Ritti, You Can Lead a Horse to Water? : A Case Study of a Police Department's Response to Stricter Drunk Driving Laws. 18. Alexis M. Durham III, H. Preston Ford, Patrick T. Kinkade, Images of Crime and Justice: Murder and the 'True Crime' Genre. 19. Anne L. Schneider, Laurie Ervin, and Zoann Snyder-Joy, Further Exploration of the Flight from Discretion: The Role of Risk/Need Instruments in Probation Supervision Decisions. Pope, Carl; Lovell, Rick; Brandl, Steven G.
4. 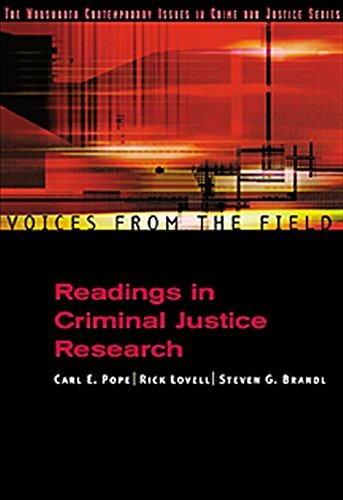 Voices from the Field: Readings in Criminal Justice Research (Criminal Justice Series) [Paperback] Pope, Carl; Lovell, Rick and Brandl, Steven G.